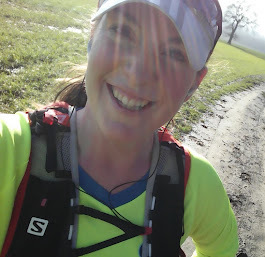 On Saturday, I ran my first ultra marathon. It was 30 miles, in 8.5 laps around Caldecotte Lake in Milton Keynes, organised by Enigma Running. I still can't quite believe that's true...so I'll say it again...I ran my first ultra marathon! My day started off pretty badly - the race wasn't until 2:30pm so my usual early morning race day routine went out the window. I hadn't slept well, woke up early, got my kit together and had a bag packed by about 10am. Then I started to get horribly nervous about the race...how would I cope running further than I'd ever run before, and what it would mean for my 50 miler if this race went wrong, and I also started panicking about what I should be eating (I knew just breakfast wouldn't be enough, but thought having a proper lunch would be too much). I was wandering aimlessly round the house getting more wound up, waiting for the time to come that I needed to leave. In the end, I gave up waiting and left early, thinking the drive would hopefully calm me down. 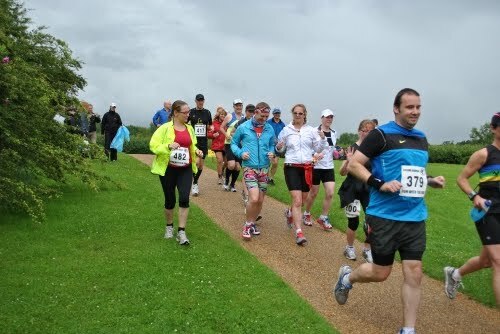 I soon realised that I'd left the house without any food, for lunch or the race, and without any drinks. I stopped at the petrol station and bought myself a picnic of some Go Ahead slices, a Mars bar, salt & vinegar peanuts and a can of Red Bull for my lunch. What was that all about?! Why didn't I buy a sandwich, a banana and a bottle of water?! I also bought a bottle of powerade and a flapjack for my race food. Flapjack?! I haven't had a flapjack for months and certainly not during any long run training. Madness. Anyway....off I drove to Milton Keynes, devouring my cereal bar, chocolate and peanuts as I went. By the time I got to the Caldecotte Arms - race HQ - the rain that had been forecast was torrential. I pulled up in the car park and even with the windscreen wipers going, I couldn't see outside through the sheet of water that was falling! My nerves hadn't abated either - if anything I was feeling more anxious, as it was starting to dawn on me that my pre-race meal hadn't been very well thought out! As I'd arrived early, I took to twitter, telling everyone how worried I felt, and was quickly reassured that the race was only four miles further than a marathon, that I would be absolutely fine, and there was no need to be nervous. I knew everyone was right, but it didn't help - by now I was feeling physically unwell with the nerves and full of doubt. Finally 2 o'clock came and I decided to go into the pub and see if I could find where to pick up my number. This is where I started to realise that this event was going to be very different to anything I had ever done before...and that becoming a part of the ultra community and the Brathay 10in10 team really is going to be life changing. I walked in. Loads of runners were sat around in the pub, drinking, chatting and laughing. Someone asked me if I was there to run...I told them my name and all of a sudden I'm getting a hug from David "Foxy" Bailey, organiser of the Engima events, former (4 time) 10in10er, and and fellow 10in10 runner for the 2013 event. He showed me where Heather was sitting (another 10in10er who lives about 5 minutes from me) and joked they'd been reading about my running exploits. Someone else told me how lots of the runners had run the marathon that morning, some of whom were running the ultra in the afternoon too. I wanted to stay and chat, but really wasn't feeling good and so picked up my number and retreated back to the car, amazed at how everyone seemed to know everyone else, and how relaxed they all were, having drinking pints and having lunch. Then, miraculously, the rain stopped...and my first ultra started. Within just a few minutes, my nerves had completed gone, and it honestly felt like a physical weight was lifting from my shoulders as I ran. 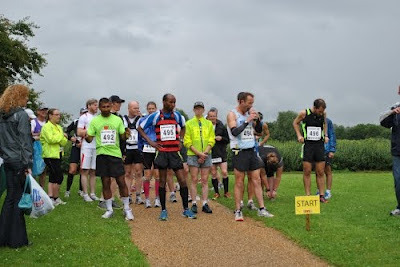 I'd been worried about the course, particularly about there being no signs or marshals telling me where to go, and about it being so wet, but there was no need. The course followed an obvious route around the lake, with white arrows clearly marked on the path where there was a choice of direction. There were puddles, but I could run around them, there was a section of boggy grass, but I could run through it, and although there was one section where a massive puddle had formed, which required us to venture into the mud at the side, inch along a log, and then jump over to the other side of the puddle, into more mud, it was all part of the fun. 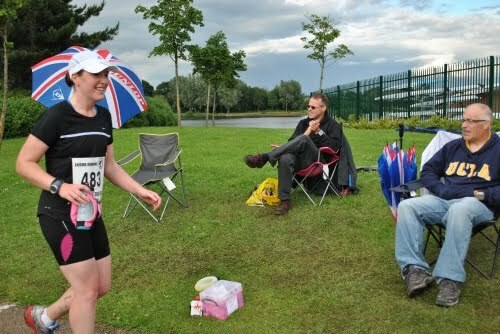 So I went on - walking sometimes, chatting to other runners, amazed at how unpressurised everything was, and savouring the realisation that my race wouldn't end if I actually stood still at a water station...just so different to my usual races! I was also enjoying the unexpected variety of scenery that the lake offered...although was hating the unbelievable number of evil geese that frequently laid claim to my path. I really don't like geese, am pretty scared of them in fact, and the one negative I will remember about this race was how many of them there were and frequently having to run past them with my eyes closed...[shudder]. Luckily, I didn't - I managed to get round to the end of the lap and swapped my powerade for water which I very slowly sipped, and kept running and walking until my stomach settled. So I was ok, my shorts survived to see another race, and unbelievably, I found myself on my last lap, which was signalled by everyone at the water station "ding-ding-dinging" at me as I passed them which brought a smile to my face :) I had originally planned to run 10min/miles but had started off at just over 9min/miles, because I got carried away at the start, but the relaxed atmosphere, walking, dodging puddles and the boggy grass section, jumping over the mud, and stopping at the water station had all brought down my pace, so I wasn't too far off my original plan. I came around the last corner and up to the finish line, crossing it at 4hrs 49mins, to be greeted by cheers and clapping, and was rewarded with a fabulous medal around my neck. I stayed at the finish line for a bit, cheering on some of the other finishers, and having a chat with Heather and Karen, who will also be running the 10in10 next year, and then David who I know on Twitter. When I decided I needed to head home, it was like saying good-bye to friends I'd known for ages...all of a sudden I seem to have been gifted this entire circle of wonderful people that I get to share my running with, not just on Twitter and Facebook, but in real life too! 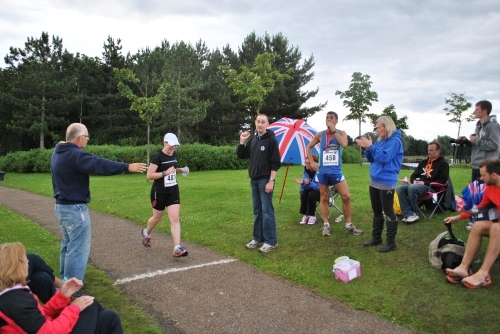 Well done on finishing your first ultra ! Sounds a great event. Thank you :) Still very pleased - it was a really fun day!